This year, Ben and I loaded up the car with the youngest four of our “Brady Bunch,” two young teens, and two 8-year-olds. It’s a pretty huge improvement over the years when the kids and I and their friends I braved this trip with a one-adult-to-five-kids ratio! My partner in crime has a calm smile and easy adaptability, and that rubs off on everyone. This was our second year making the Holiday World adventure together. His “glass is half full” attitude was super useful when I realized 20 minutes into the road trip that I’d left the tickets at home (ughhh! ), and when the younger kids wanted to pull us in opposite directions immediately upon arriving. It was hard not to notice that there were some people there who seemed to have forgotten they were supposed to be having FUN. While waiting in line for the Liberty Launch to blast our kids into the sky (a favorite ride for all but one in our bunch!) Ben noticed a woman wearing a “Radiate Positive Vibes” t-shirt and a scowl on her face that looked like she wanted to kill someone. “She is radiating something, for sure,” he joked. I like what we radiated a lot better. It was pretty weird, but fun, to see the 8-year-olds in the driver’s seats on the Lewis and Clark Trail ride. Dawson may have hit the gas just a wee bit too aggressively for his dad’s sore neck (ooops) but then he got very intense and focused on the road ahead. Just ahead of them in my car, it was surreal to sit in the back seat and watch my 13-year-old Clara give her little sister a bumpy driving lesson. I love seeing kids get a big rush out of that kind of power. Glad we packed Tylenol, though. Holiday World does an awesome job making the entire park look like an autumn tourist attraction. There are tons of spooky attractions they add just for the Halloween season, and fall decorations absolutely everywhere. Daisy was all about posing for me among bales of hay, pumpkins and gourds. If you love having adorable fall family photos but haven’t made it out to an orchard or pumpkin patch, this outing might kill two birds with one stone! 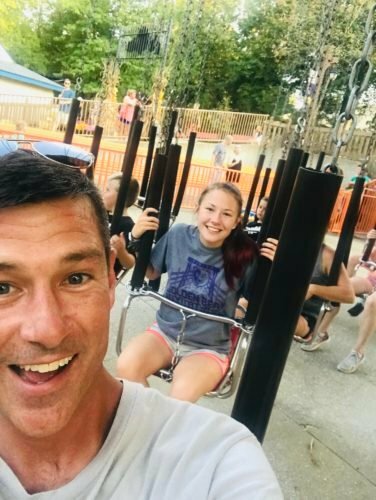 One of the trickier things to navigate in an amusement park is when you have some members of your group too young or too intimidated for the “big rides.” We had three who were ALL ABOUT the thrills, and the youngest, Daisy, who was not. Big sis Clara almost had Daisy talked into trying the Thunderbird again this year, but Daisy remembered how intense that ride was from last year, and she just couldn’t get up the nerve this time. (I can’t blame her – I screamed the entire time as our dangling feet flew past trees and barns!) I loved watching this moment, though – Clara’s arm around her sister, gently trying to encourage her as we walked toward the towering ride. Here’s how you do it if you have enough people: Split up when you need to, one group on the thrillers, the other on something milder – and try to let everyone have some “wins.” Daisy was happy doing the Turkey Twirl while the other kids tried not to lose their lunch on the Thunderbird, Legend and Voyage. “Divide and Conquer” can be a necessary survival trick, you just have to be prepared to make split second decisions, and make a solid plan to regroup afterwards. That being said, when you find something everyone in your group enjoys, GO FOR IT. The Hallow Swings were the universal hit for our group. Daisy was screaming “WOO-HOO! !” with her two little arms spread wide like wings. It was so much fun that, on our way out of the park, exhausted, we decided to stop for one last night swing. The lights on that ride at night are breathtaking. Everyone was full of adrenaline, laughing, chatty, and giddy as we walked past Santa one last time and back through the front gates. Ten minutes later, we were on the road, with a car full of sleeping kids. It takes a lot of energy to make a day like this happen. I’m still recovering two days later! But if you’re willing to pay that price, and can keep a lighthearted attitude during the challenging moments, you take away something awesome: The chance to imprint your family’s history with joy and magic. Visit HolidayWorld.com for tickets and details. The park is open Saturdays and Sundays through October 28 for Happy Halloween Weekends, tickets range from $29.99-$34.99 and include free parking and soda. What does it take for a child to succeed?